Former Defense Minister who opposed 2005 disengagement visits center dedicated to memory of destroyed Jewish communities of Gaza. 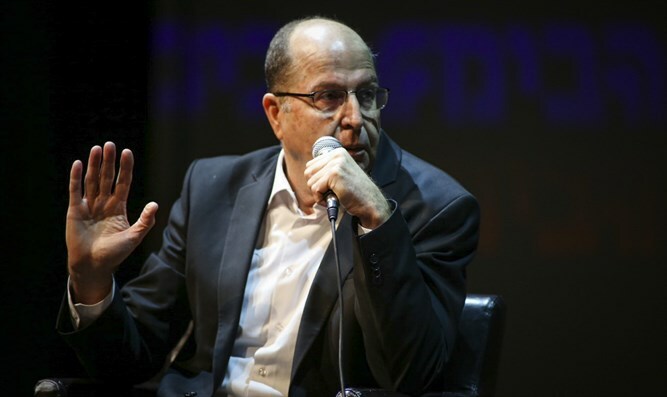 Former Defense Minister Moshe Ya'alon inaugurated the electronic gala commemorating all those who fell in the Gaza Strip before the establishment of the State of Israel during his visit to the Gush Katif Center in Nitzan Wednesday. Ya'alon then toured the visitors' center and learned about the Jewish communities of Gaza and the social and security contributions their residents made to the State of Israel before their homes were destroyed as part of former Prime Minister Ariel Sharon's disastrous Disengagement plan. Ya'alon addressed the heroism of the former residents of Gush Katif, and said that in his opinion, "the heroism was on the part of the soldiers and also of the settlers who had dealt with terrorism [before the disengagement], and who today are struggling to continue the path of pioneering and settlement throughout the country." "Ya'alon is a real hero who expressed his opinion as chief of staff, opposed the disengagement and did not change his mind even under pressure, which led to non-renewal of his appointment as chief of staff," said the director of the center. Upon the completion of the tour, the album of the Jewish communities of Gaza was presented to Ya'alon. "It is exciting to be in the in the Katif Center, which that tells the story of success and sacrifice. The disengagement was a breaking point in the history of the State of Israel and we must draw [the appropriate] lessons from it for the sake of our future," Ya'alon said in thanks..